Pastoral Meanderings: For the curious or those who wish to incite a riot of comments. . .
For the curious or those who wish to incite a riot of comments. . . 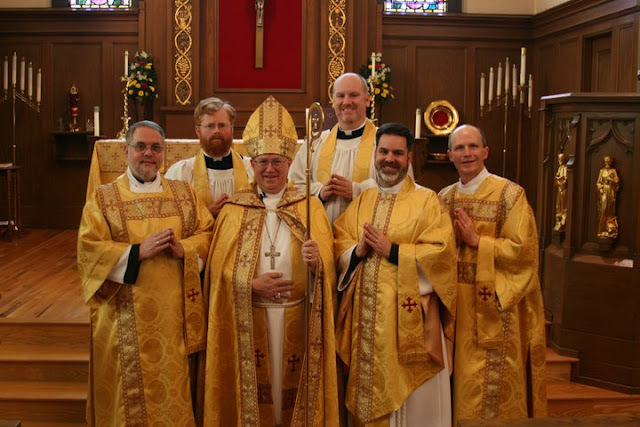 If you are over the age of 40, it is apparent that the plethora of hats, gloves, capes, hoods, and layers of vestments were for the purpose of keeping men warm on a daily basis in unheated churches. Chanting likewise was a practical solution to an individual liturgist being heard throughout a cavernous church space in an age before the microphone. "Chanting likewise was a practical solution... being heard throughout a cavernous church space in an age before the microphone.in an age before the microphone"
But that doesn't explain why some don't sing the Psalms. They were written to be sung. They were sung by pilgrims going to the Temple. They have been sung continuously for thousands of years. Why would any Christian NOT want to sing the songs that God literally gave them to sing? Instead most Christian loves to sings songs that any Mormon, Jew, Muslim, Universalist could also sing the same song and no one would ever be offended. "vestments were for the purpose of keeping men warm on a daily basis in unheated churches." But that doesn't explain why God wanted vestments on his pastors, prescribed in the Old Testament that was continued in the New unto today. Nothing in Scripture also says you can't give your children chocolate, candy and microwave pizza EVERY day for supper either. And so in my Christian freedom I am going to give my children candy/junk food every single night for supper; because they enjoy it, always eager to come, invite friends to come over and they want to come back, and some wouldn't eat unless I do it. And no one can tell me their supper is better than mine! As long as we are eating, more people come eat, and people stay alive and go to heaven what does it matter? Some in the Missouri Synod are trying hard to catch up. You have a curious way of arguing, and seem oblivious to the distinction of Law and Gospel. Lutherans have the freedom to use or not use ceremonies in the congregation (beyond what is mandated by Christ: preaching the Gospel and administering the sacraments) as long as they serve the functions of teaching, order, and decorum. The Reformed believe, to varying degrees, that the Bible mandates specific worship forms. Your argument is Reformed, not Lutheran. Therefore we believe, teach, and confess that the congregation of God of every place and every time has, according to its circumstances, the good right, power, and authority [in matters truly adiaphora] to change, to diminish, and to increase them, without thoughtlessness and offense, in an orderly and becoming way, as at any time it may be regarded most profitable, most beneficial, and best for good order, Christian discipline, and the edification of the Church. Flacius and the Gnesio Lutherans at Magdeburg mounted a massive propaganda campaign against the reestablishment of the surplice in all conquered Lutheran churches in the late 1540s-50s. Why did so many Lutherans get rid of the surplice in the first place, that reintroducing it would cause scandal? Zeeden notes that only 3 parishes around Magdeburg used the chasuble. Wouldn't this indicate that Lutherans made practical decisions about adiaphora on the congregational level, in spite of regional church orders, and that the majority of German Lutherans (yes, not all) were wary of mass vestments? Weren't mass vestments abandoned by many in the fervor of the early Reformation (1520s) as a protest (Lutheran because of what they "taught," i.e. the power to effect transubstantiation, and Reformed because the Bible doesn't command them) against the Roman Catholic church's understanding of the mass? How "Lutheran" are the Palatinate and Hesse's whitewashing of their own Lutheran churches in the 1520-30s, at the direction of their Lutheran rulers and against Luther's wishes? Was this simply a manifestation of early Evangelical fervor, like sporadic instances of iconoclasm, which didn't yet have a Lutheran "doctrine of adiaphora" to guide it yet? What was the earliest Lutheran statement on adiaphora? Was it the Babylonian Captivity, Freedom of a Christian, or preface to the German Mass? How should Luther's pastoral advice to a minister complaining about having to wear mass vestments in Brandenburg ("Wear as many as the Elector commands, provided the Gospel is preached.") inform our current debates about the importance of certain vestments as being "more Lutheran"? I would like very much to have a simple biretta, but they start at something like $130 and go up from there. This is more than most priests can readily afford. And people wonder if Rome really has a gay problem or not? Only hints that "some" in the LCMS were popish. 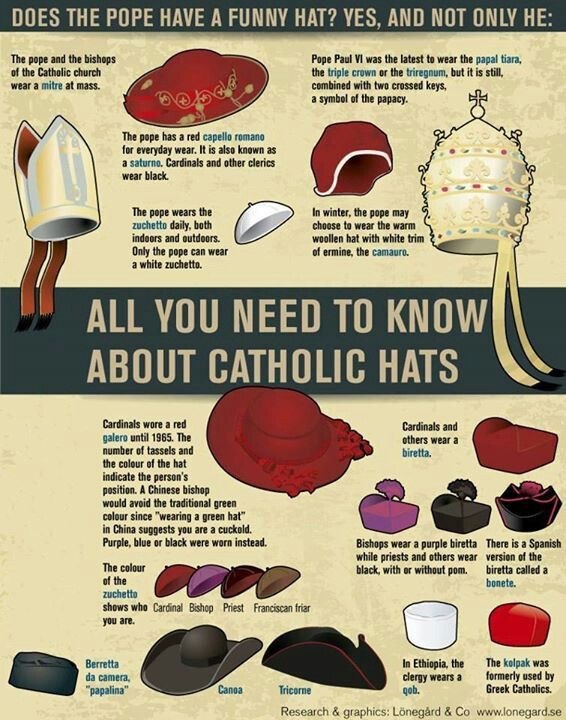 The biretta is a good Protestant hat. You should Netflix Fellini’s “Roma” sometime. The ecclesial fashion show will leave you howling.